Product versions: Please select option Auro 267 - 0.75 ltr. Auro 267 - 2.50 ltr. 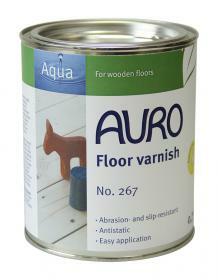 Provides very hard-wearing and dirt-repellent wooden floors: solvent-free, transparent floor paint with moderate gloss. Slip- and abrasion-resistant, saliva- and perspiration-proof. Pretreat wood types rich in active substances with AURO Special primer No. 117, other wood types with AURO Hard primer No. 127. Can be tinted to colours - contact us for more details on this!